To order a printed copy of the Titan Travel: UK Short Breaks brochure, simply click the Request button below. If you're looking for inspiration, there are plenty of ideas in this new edition of our UK Short Breaks brochure. How about a traditional seaside holiday? Join us on our Devon Short Break, based in a 4-star hotel in Torquay, with an excursion to Dartmoor National Park and a ride on the South Devon Railway included. Titan's extensive brochure has been created with every individual in mind. So whether you're looking for a quick weekend away or a memorable holiday, there's a break to suit everyone. Take memorable trips to Scotland and Ireland, themed to suit every preference, and discover the intrinsic pleasures of the UK. Whether to explore the culture or wander the landscape, Titan's priority is always to provide a journey of discovery. Why not go the extra mile and immerse yourself in the magic of a British Pullman tour? If you love authentic experiences, the carriages of the renowned Venice Simplon–Orient Express have been lovingly restored to their former 1930s grandeur. Visit Britain's finest cities and stately homes and travel in decadent luxury. To find out more about Titan's professional and unique packages, order your Titan – UK Short Breaks brochure now. Titan Travel: UK Short Breaks Brochure Veronica H. said: Been on Titan tours before and would. Use them again it was a fantastic holiday and we were w ell looked after. Titan Travel: UK Short Breaks Brochure Cecilia C. said: I love exploring new places in the UK and this has some great ideas for places that I havent been to yet. Its very colourful and easy to read and the prices listed on there are very accessible. I will most definitely be booking things from there fairly soon. I am very satisfied with the product, so kudos to everyone for a great job. Titan Travel: UK Short Breaks Brochure Karen L. said: I will use to plan travel in 2015. Titan Travel: UK Short Breaks Brochure Susan T. said: Great choices and ideas. Considering for next year. Titan Travel: UK Short Breaks Brochure Beryl M. said: Not in a position to book at the memento but have kept brochure. Titan Travel: UK Short Breaks Brochure Christina F. said: I was impressed by the variety of places to go and things to do. Titan Travel: UK Short Breaks Brochure Edward F. said: A great selection of places to visit. Titan Travel: UK Short Breaks Brochure John B. said: Considering my summer holidays. 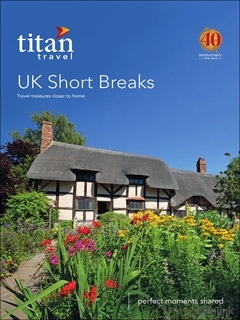 Titan Travel: UK Short Breaks Brochure Jean M. said: Need time to study but looks well laid out. Titan Travel: UK Short Breaks Brochure Margaret F. said: I have been going on Titan Holidays for the last 2 years and am about to go on a cruise via them. By pressing the Request Printed Brochure button you give consent to Titan Travel: UK Short Breaks (and their Data Processors for the specific purpose of delivering your literature) to send you their Brochure .